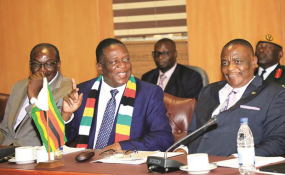 President Emmerson Mnangagwa flanked by Vice Presidents Constantino Chiwenga, right, and Kembo Mohadi (file photo). Vice President Constantino Chiwenga is back in the country and attended Tuesday's Cabinet session, New Zimbabwe.com has learnt. "Vice President Retired General Dr Constantino Chiwenga attended today's Cabinet meeting, together with VP Kembo Mohadi, President Emmerson Mnangagwa and Chief secretary to the President and Cabinet Dr Misheck Sibanda," a caption to the picture said on State broadcaster ZBC's website. Chiwenga was reportedly airlifted to South Africa late last week after a health scare during a politburo meeting in Harare amid claims he was in "bad shape". Government refused to comment but authorities in South Africa were forced to issue a statement denying the vice president was being treated at Cape Town's Groot Schuur Hospital following wild cate protests by a small group of Zimbabweans. South Africa's Western Cape Health Department said Chiwenga was not being treated there.